The patient is a 28-year-old woman with ESKD due to hypoplastic kidneys, who started peritoneal dialysis at age 11 years, received her first kidney transplant (deceased donor) at age 14 years, and experienced allograft failure at age 19 years. She returned to peritoneal dialysis; a transplant nephrectomy revealed “severe tubulointerstitial rejection.” There was no mention of SV40-positive tubular epithelial cells. After 9 years on dialysis, she underwent a living unrelated kidney transplant, treated with rabbit anti-thymocyte globulin induction and maintenance immunosuppressive therapy with tacrolimus 3 mg twice a day (target trough 8–10 ng/ml), mycophenolic mofetil 750 mg twice a day (target MPA at least 2.0), and prednisone 10 mg daily. At the time of transplant, her panel reactive antibody was 7% (class one) and 21% (class two). Single antigen bead HLA testing was negative for donor-specific antibody. Donor and recipient were matched at one A locus, with a shared mismatch with the first donor to A68. The patient was cytomegalovirus and Epstein–Barr virus immune. Her serum creatinine at 1 month post-transplant was 1.5 mg/dl (eGFR of 35 ml/min per 1.73m2). Her post-transplant course was complicated by BK polyomavirus viremia at 3 months post-transplant, treated with leflunomide in place of mycophenolate. Results of a surveillance biopsy performed at 6 months post-transplant was unremarkable. At 14 months post-transplant, when the BK viremia resolved, mycophenolate was resumed in place of leflunomide. At 18 months post-transplant, azathioprine was prescribed in place of mycophenolate because the patient was experiencing severe diarrhea. By month 20, she was stable and doing well. However, over months 22–28 post-transplant, routine laboratory testing showed a gradual rise in serum creatinine up to 2.3 mg/dl (eGFR of 22 ml/min per 1.73m2), with some detectable proteinuria. Her tacrolimus level was 7.0 ng/ml. Her physical exam was notable for high BP (165/85 mm Hg) but otherwise unremarkable, without allograft tenderness. A urinalysis was without cellular elements and her complete blood count was normal. What is the most likely cause of the progressive loss of kidney function in this patient? The correct answer is C. When considering acute allograft dysfunction, even more than 2 years after transplantation, one must consider the usual reversible suspects, such as volume depletion and tacrolimus toxicity. Tacrolimus toxicity is less likely here because trough levels were not particularly elevated. BK nephropathy is less likely with a negative 6-month biopsy sample and without BK viremia. Acute tubular necrosis seems unlikely without any inciting event or the addition of a nephrotoxic agent. Given the prior allograft loss with sensitization and shared mismatch with first kidney donor, AMR seems most likely given progressive graft dysfunction, proteinuria, and reductions in immunosuppression due to BK viremia—known risk factors for the development of de novo donor-specific antibody (1). An allograft biopsy was performed as kidney function continued to deteriorate. By light microscopy, there were lesions of thrombotic microangiopathy (TMA), with moderate peritubular capillaritis, interstitial fibrosis and atrophy, moderate hyalinotic arteriolopathy, and mild arteriosclerosis (2). C4d and BK immunostaining were negative. These biopsy findings were suggestive of AMR. Which of the following is the least appropriate next step in management of this patient? The correct answer is D. The presence of TMA lesions has a broad differential post-transplantation. It is critical to make the correct diagnosis quickly as allograft failure is often imminent. Genetic testing of complement mutations, although expensive, may shed a clue on isolated TMA in the kidney allograft. Option B is also appropriate as it is one of the three criteria needed to establish a diagnosis of acute AMR, even when the C4d stain is negative (2). Option E is an acceptable step in the differential diagnosis of TMA of the kidney, although there was no systemic evidence of thrombotic thrombocytopenia purpura (TTP) (normal red blood cell and platelet counts). In the presence of TMA lesions of the kidney, it would be reasonable to hold tacrolimus therapy (option C), although tacrolimus-associated TMA late post-transplant and without other hematologic features is unusual (see below). Finally, option D is not a logical next step, as plasmapheresis is typically beneficial only in early acute AMR and the role of plasmapheresis for episodes of AMR occurring so late in transplantation has questionable efficacy. Although plasmapheresis is used for TMA in the case of TTP, our patient’s TMA was kidney limited. Additional laboratory testing to address the differential diagnosis included normal serum LDH, haptoglobin, and total bilirubin. Single antigen bead testing was negative for donor-specific HLA antibodies and negative for antibodies to MHC class I–related chain A and chain B, HIV antibody, anti-nuclear antigen antibody, anti-double-stranded DNA antibody, normal C3, C4, and CH50, and normal ADAMTS13, and a negative drug abuse screen. On the basis of the above, she was treated with intravenous corticosteroids and Ig for antibody-negative AMR. Her serum creatinine peaked at 2.7 mg/dl and improved to 2.1 mg/dl after treatment. Two months after this episode, her genetic testing was remarkable for homozygous deletion of complement factor H-related (CFH) proteins CFHR3–CFCHR1, establishing a diagnosis of atypical hemolytic uremic syndrome (HUS). Her anti-CFH antibody levels were negative but her complement factor I (CFI) level was normal. She received a meningococcal vaccine and her eculizumab therapy was initiated. Three months later, her serum creatinine was stable at 2.1 mg/dl and she continued with this therapy. TMA is a histopathological lesion of arteriole and capillary thickening, intraluminal platelet thrombosis, and obstruction of the vessel lumina. Consumption of platelets and hemolytic anemia characterize the syndromes of HUS and TTP. Although only about 10% of HUS cases are due to atypical HUS, attributed to abnormal activation of the alternative complement pathway (Figure 1), the disease itself is associated with a high rate of ESKD and 25% of cases will be fatal (3). In the de novo setting after kidney transplant, TMA is one of four histologic entities required to make a diagnosis of acute AMR, and its presence in an allograft biopsy, coupled with complement activation in peritubular capillaries (C4d staining) mandates evaluation for anti-donor antibody (2). Other considerations in the differential includes calcineurin inhibitor or mammalian target of rapamycin inhibitor therapy. Donation after cardiac death results in prolonged warm ischemia, with subsequent diffuse endothelial injury leading to possibility of TMA. Similarly, violent brain causes endothelial injury, leading to TMA-like syndromes. Other concerns include lupus, scleroderma, or anti-phospholipid antibody syndrome. With cyclosporine A, the incidence of TMA has been reported as 5%–15% (3), with about 45% graft loss. It is unusual with tacrolimus, only reported in 1% of use (4). About 30% of patients will actually have mutations in CFH or CFI or both, not detected before transplant (5). Finally, about 30% of transplant-associated TMA cases, there are no signs of hemolysis or thrombocytopenia, as was seen in our patient. Alternative pathway complement activation is linked to atypical HUS. There is normally continuous low-grade hydrolysis and activation of C3 by complement factors B and D, resulting in C3 convertase (C3bBb), which cleaves C3 to C3b. C3b binds complement factor B and creates an internal amplification loop. Binding of C3bBb to C3B results in C5 convertase cleaving C5 into C5a and C5b. 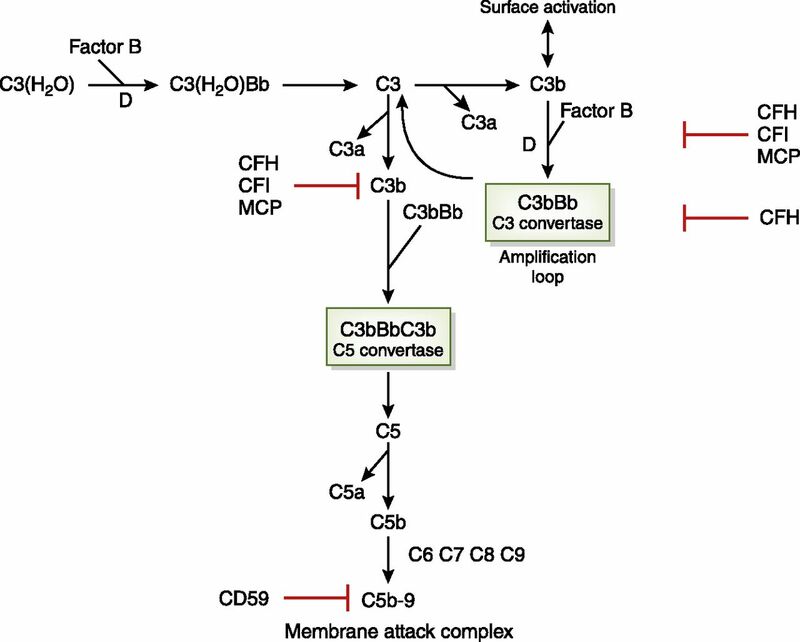 C5b initiates the development of the membrane attack complex (MAC). Regulators of this activation include CFI, which degrades C3b and C4b, CFH, which acts as a cofactor for CFI for C3b cleavage and decay of C3 convertase, and MCP, which binds C3b. CD59 prevents polymerization of the MAC. As discussed in the text, atypical HUS may be associated with loss-of-function mutations in the genes coding for CFH, CFK, and MCP. There may also be combinations of mutations in these factors. In pediatric patients, there may be autoantibodies to CFH, resulting in CFH deficiency, and these patients may also have deletion of genes for CFH proteins CFHR1 and CFHR3 (not shown). Gain-of-function mutations may also occur in the genes for C3 and complement factor B with hyperactivity of C3 convertase. Adapted from Noris and Remuzzi (4), which is available under the terms of the Creative Commons Attribution License. Recurrence of TMA post-transplantation leading to allograft failure and patient death is a key concern. We had no prior knowledge that the patient’s graft loss was due to TMA, which confused clinical management. Genetic testing in patients with native kidney disease can miss the diagnosis; overall, 40%–50% of patients carry loss-of-function mutations in genes coding for the complement regulators CFH, membrane-cofactor protein (MCP), and CFI, and in about 10% of cases (mainly children), autoantibodies against CFH were found that cause functional CFH deficiency. Most patients with anti-CFH antibodies have a homozygous deletion of genes for CFH proteins CFHR1 and CFHR3 (4). The majority of these recurrences were noted early in the first month, dependent on the type of mutations (6,7). Compared with CFH and CFI mutations, patients with C3 and complement factor B are at less risk, and those with anti-CFH antibodies seem to do better. Finally, MCP is a membrane-associated regulator of complement that limits complement activity at the cell surface, and patients with this mutation uncommonly experience recurrence as the endothelial cells from a normal allograft kidney express normal levels of MCP. TMA lesions may be associated with acute AMR (2), and intraluminal thrombi, C4d staining of peritubular capillaries, and circulating donor-specific antibody are typical. Differential diagnosis between these two entities is difficult because both share the feature of impaired kidney function and do not respond to antirejection treatment. However, predominant endarteritis and general involvement of the entire vascular tree are peculiar for AMR. Management of post-transplant disease is guided by genetic testing. Strategies include simultaneous liver kidney transplant for CFH mutation (8), preemptive plasma exchange and perhaps rituximab for CFH antibodies (9), and preemptive use of eculizumab (10). The duration of treatment is controversial, but given the high rate of recurrence, it is continued as long as allograft function remains intact (10). In our patient, it was too late to discuss preemptive therapy. The clinical stabilization of her kidney function is assuring. This case reminds even the most experienced clinician to review any available biopsy information and dig deeper into the cause of native kidney failure and prior allograft loss. V.R.R.M. has no relevant disclosures. R.B.M. has received grant funding from Alexion, Astellas, Quark, and CareDx, honoraria from CareDx, and is an Associate Editor of the Journal of the American Society of Nephrology.